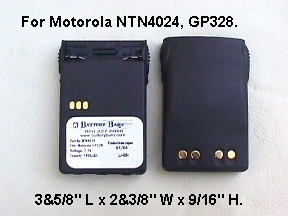 For Motorola - NTN4024, JMNN4023, JMNN4024, JMNN4024 batteries, it works for radio model number PRO5150 Elite, EX500, EX-600, GP328 Plus. Lithium Ion battery, 7.2 to 7.5 V , 1100 mah. Dimensions at 3&5/8" L x 2&3/8" W x 9/16" H. The battery is brought to you by Battery Barn. Your original charger will charge this battery.